Jebs Apps is excited to announce our newest app for Real Life Achievements, RLA Maker. Simply take photos of your friends, add custom achievement badges to any photo and share them on Facebook, Twitter, Email or SMS (for iPhone, iPod touch, iPad). 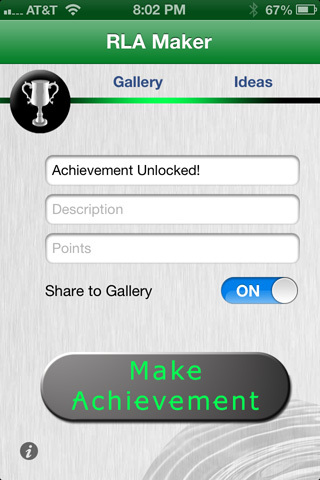 Oct. 24, 2012 - PRLog -- Any gamer will tell you how prestigious it is to acquire those XBox Achievements or PlayStation Trophies and now you can create your own, Real Life Achievements with the RLA Maker app for your iOS device (iPhone, iPod touch, iPad). According to About.com, "Achievements are a special way of both rewarding you for playing games as well as keeping you compelled to continue playing." What better way to keep you "playing" in real life than to award your friends and family with Real Life Achievement badges and points! RLA Maker allows you to add a special achievement badge to any new or existing photo and capture your friends at the most inopportune time. You can then upload these photos to our public online gallery or share them with your friends and family via Facebook, Twitter, Email or SMS! It's a fun little app for geeks, gamers, young and old! Are you ready to conquer some Real Life Achievements? View our list of Achievement Ideas (http://rla.jebsapps.com/achievementList.php) or create your own and share it with your friends. See who can finish the list of achievements first in your group! Have your own ideas for an achievement? Send them to us at RLAMaker@jebsapps.com and we'll add them to the ideas list! So, get out there, take photos and have fun!